With the insects coming out in spring the temptation to shoot bugs of all sorts is high. 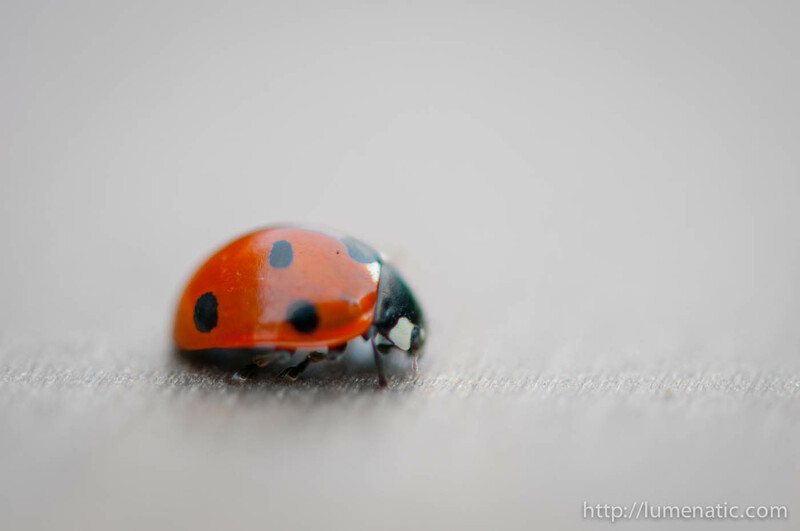 Especially ladybugs are crawling around a lot these days as you might have realized from my previous post. Today I got the opportunity to shoot another ladybug. Both images were taken with the Nikon D300s and the Nikkor 105 mm f2.8 VR macro lens. I decided to do a colorkey on the images since the table the bug was shot on has a very pale brown color – that looks better in grayscale’s. The complete workflow as been done in Lightroom. I enhanced the saturation a little to bring out the red of the ladybug’s carapace. Then I used the brush tool with saturation set to -100 and painted everything but the ladybug to get rid of the colors. I used a large brush mainly and switched to a smaller one only for the space between the bug’s legs. As a final touchup I brought down the lights on the bug’s carapace with the brush tool and also removed a blue shimmer (the sky reflecting in the carapace). The latter I did with by again using the brush tool and setting the color temperature a tad to the yellow side (for those of you who don’t use Lightroom: There is a slider in allowing you to influence the color balance. Left – blue; Right – yellow. The blue could be removed by moving the slider to the right). Each image took around 5 minutes of post processing in Lightroom. Again I am astonished by the efficiency of the Lightroom workflow. Enough for today – enjoy the images and make the best use of the summer ! Grab your camera and go out !